I have enjoyed reading Dr. Winkel’s fine translation as much as I have reading the original Arabic text, and I have no doubt that a work such as this conveys the flavor and sense of Ibn ʿArabī’s grand vision, which was given to him as a gift from God. A new period of Ibn ʿArabī studies is opening up in the world with this translation of his major work, the most important source ever produced, in my opinion, for the study of the sciences of Sufism, a universal and everlasting reference point for those who explore their inner experiences in search of the meaning of Reality. “Read what has been deposited in my ruled lines.” With this command, Ibn al-ʿArabī starts to see the structure of the 560 chapters that will become his Openings, which he will dictate to his circle of friends. He is recording the knowledge he found etched in light throughout the body of the Youth. The Openings at Makkah, al-Futuhat al-Makkiyah, is one of the greatest works of Western civilization. At ten thousand pages, the size alone has been an obstacle to audiences, with the first complete critical edition of Abd al-Aziz Sultan al-Mansoub appearing only in 2010 (with a second edition in 2013 from Cairo). This translator has been working on the first complete translation of The Openings in Makkah since 2012. Dr. Eric Winkel has been studying the Futuhat al-Makkiyah for 23 years. 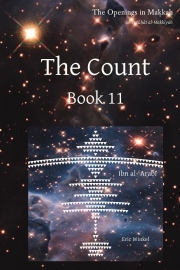 During his time at the International Institute of Advanced Islamic Studies (Malaysia) as Senior Research Fellow, exploring the “new sciences” and Islam, Eric found intriguing connections and correspondences between Ibn al-Arabi’s strange mathematics (in which 1 squared does not equal 1) and twentieth century non-commutative geometries. Since 2012 he has been working exclusively on a six-year project to produce the first complete translation of the Futuhat al-Makkiyah. He is readying 4,000 pages in preprint now.